We are always searching for new custom products for our readers. We were so excited to find Otis James and then to realize they were in our own backyard! Otis makes all of the neckties & bowties by hand, right here in Nashville. The company focuses on quality, originality, and style. The materials they use are often unconventional such as wools, linens, cashmeres, and cottons. 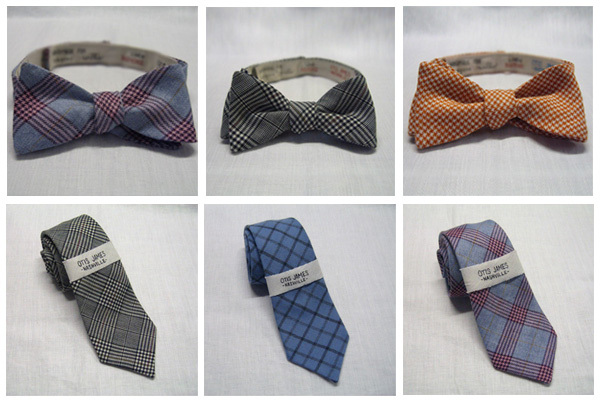 They love & encourage customers to come to them for custom work, which is perfect if you are trying to find the right tie/bowtie for your wedding! Images by Otis James // To view some examples of custom wedding work by Otis James, click here.